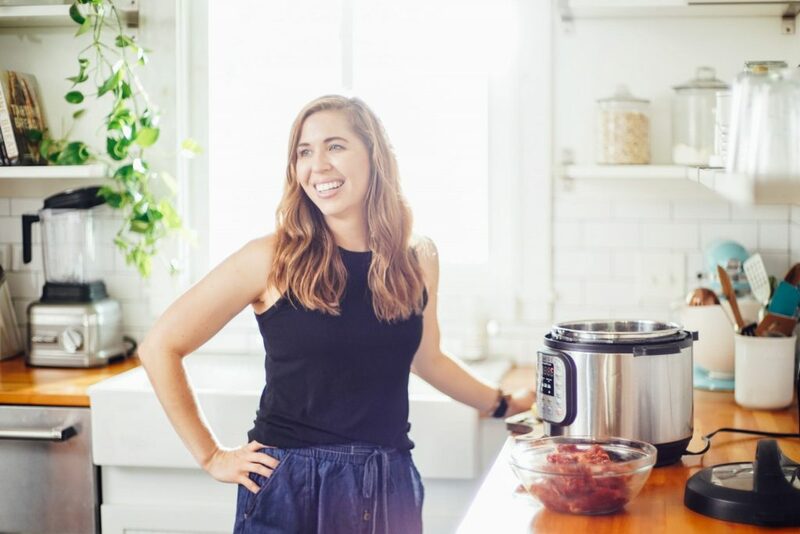 Meal planning is one of the most important routines you can add to your life if you want to enjoy a real food lifestyle, but meal planning can also be frustrating and feel overly complicated. 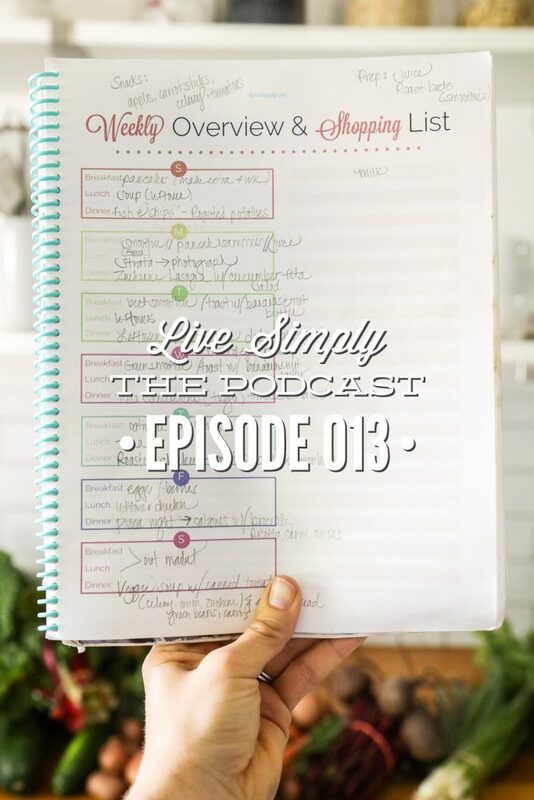 Today, on Live Simply, The Podcast, I’m sharing what exactly a meal plan is, why it’s so important, and the one thing that’s helped me simplify meal planning and make it practical and enjoyable. 1. A meal plan offer us a guide for how to use the ingredients we purchase. Without a plan, we oftentimes have good intentions–buying a head of kale or lettuce, or picking up a pound of ground beef–but it’s easy for life to takeover during the week, which means we forget about the food we purchased on Saturday. 2. A meal plan helps us be strategic in the way we use ingredients, which saves money and helps us be responsible consumers. A meal plan provides you with direction for how you’ll use the ingredients in the fridge, pantry, and/or freezer for this set time. A meal plan can be created before you go to the store or market, and then you shop based on your plan and gather ingredients needed to make this plan happen. Or, a meal plan can be created after you shop at a market or grocery store, based on the ingredients purchased. Now, if you’re new to real food and cooking at home, I think making a plan, and then purchasing ingredients from this plan, is the way to start. Over time, as you learn your way around the kitchen, and begin seeing how you can use ingredients because you’re experimenting with cooking and recipes, you’ll build up your muscles enough to be able to go to the market or store first, purchase what’s in season or on sale, and build a meal plan around those ingredients. But this skill comes with time, practice, and the experience to know how to use these ingredients to create multiple meals. 3. A meal plan simplifies life. Once we have a plan in place for a set period of time, we no longer need to think about food during this time. Sure, we need to prepare and cook (or whatever the plan may call for), but we don’t have to waste our precious brainpower figuring out what to eat each day or how to use ingredients. This means we won’t be tempted to go through the drive-thru or stop at the store for the box of ready-made dinner most days, because there’s a plan–we know what we’re eating or we already ate because of that plan. There are a lot of misconceptions about meal planning. 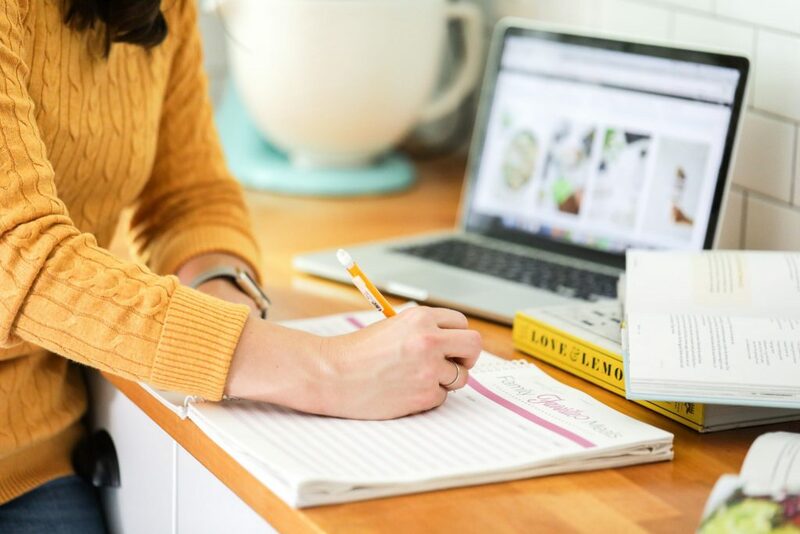 People oftentimes associate meal planning with a rigid plan, or an activity that should take hours on the weekend, or an activity that should involve a huge stack of cookbooks and food magazines, or something only “organized people” do. Let’s debunk these misconceptions by talking about what exactly meal planning is…because it isn’t a scary thing. 1. A meal plan is simply a guide, or a road map that tells provides direction for meals over a set period of time. That’s it! A meal plan is not some rigid system, and it doesn’t need to be complicated (we’ll talk more about this later with my simplifying hack). It should be a simple guide, that provides us with a meal framework for this set time so we don’t have to stress about our meals or resort to boxes, packages, or drive-thru’s on a consistent basis. 2. A meal plan is based on your schedule, and should be designed to work for you and simplify your meals and thinking about meals. I recommend looking at your schedule first for the set period of time you’ll be planning (for example: a week, or 5 days), and then adding meals to a calendar or sheet of paper or a note on your notes app in your phone, based on your schedule. If you know you’re going to have a busy Monday, plan to make a meal that requires very little hands-on time and chopping on Monday. If you’re going to have a slow Saturday morning, you may want to plan to make something that requires more time, like pancakes or waffles, or a breakfast casserole or frittata. And maybe you’ll even want to make extras that morning to store away and plan to use at a later time when life is busy again. 3. A meal plan is also flexible. Yes, you may write down a plan for each day, but this doesn’t mean you have to make Monday’s recipe on Monday. If you get to Monday, and the day was so busy that you decide eggs and sourdough toast are going to be easier, great! Make the eggs and toast. And just move your Monday plan to another day. Or, maybe you’ll choose to make Monday’s meal on Tuesday, and make Tuesday’s meal on Monday. I think many people hate the idea of “meal planning” because it feels rigid, or they buy into the other misconceptions we talked about. And that’s not what a meal plan is, or should be. A meal plan should help you, it should simplify your life. A meal plan should work for you, and continue to work for you throughout the week. A meal plan should also be easy to put together, and shouldn’t take your entire Sunday to figure out. A meal plan should literally take minutes to put together. And this brings me to the one thing that’s completely changed the way I meal plan…the hack or tip, that’s simplified my planning. 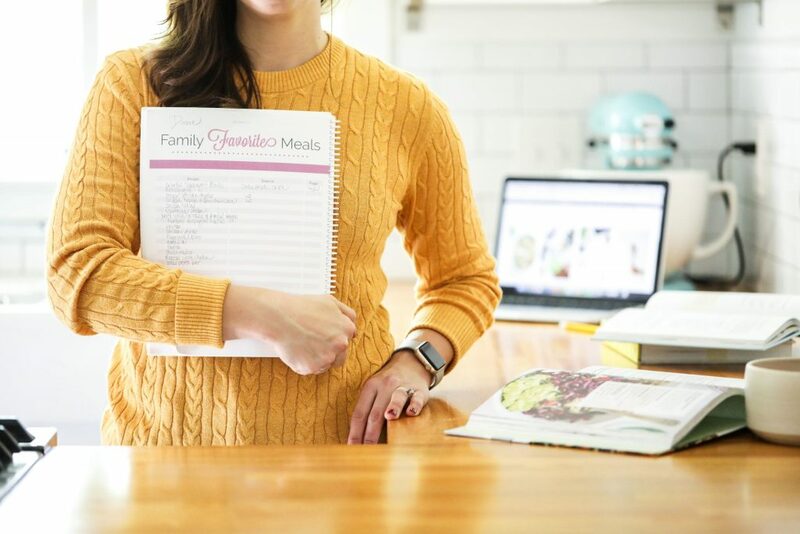 The key to simplifying a meal planning, and creating a meal plan in just a matter of minutes and a meal plan that your family is going to enjoy, and a plan you can confidently use and cook from, is found in something I call a master list, or a capsule list. A capsule meal list is much like a capsule wardrobe; a term that you are probably familiar with. The capsule concept was created by Susie Faux, a London Boutique owner in the ’70s. According to Faux, a capsule wardrobe is a collection of a few essential items that work together and don’t go out of style (timeless). Just like with a capsule closet full of clothes, which you rotate and wear over and over again, a master or capsule of recipes is a list of recipes or meals that you can rotate and lean on over and over. 1. To create a master list, you’ll need to first gather meal ideas or recipes. Gather your family together and ask, “What are your favorite foods/meals?” Based on your family’s suggestions, create a list of capsule/master meals. Hamburgers? Chicken salad? Scrambled eggs? Burrito bowls? Write down each suggestion. Do you have a favorite recipe from Pinterest that you regularly make? Awesome, write it down. Is Grandma’s famous breakfast casserole a huge hit with your family? Great, write it down. Also, these ideas don’t have to be formal (written) recipes. They can be more ideas if you prefer and feel comfortable cooking this way: stir fry, burgers, hard boiled eggs, toast, veggie soup, quesadillas, etc. 2. Now create a Capsule/Master Meal List. Now it’s time to take your rough draft notes and create a more polished list that you can regularly use to build a meal plan. I recommend writing down the following information on your list: recipe name, source, page. If the recipe is found on a blog, write down the blog name under the source information, or the Pinterest Board where the recipe can be found. If you don’t want to keep a paper list, then use your Notes App or a document on your computer to store this information. The goal is creating a list that you can refer to over and over again. The way you do this is completely up to you. If you’d like to add variety to your meal plan with new meals, I recommend keeping a separate list (I call my list, Recipes to Try) with meal ideas from Pinterest, cookbooks, magazines, and blogs. When you feel the need to spice things up, take a look at this list and add a new recipe to your meal plan. If you try a new recipe and your family loves it, add it to your Capsule/Master Meal List. 3. Now that you have a master or capsule list, it’s time to put that list to use to create regular meal plans, without spending hours doing so. Set aside a certain time each week to meal plan, and mark this time on your calendar. When it’s time to sit down and create your plan, pull out your list. Use this list to build your meal plan. I also like to take into consideration what’s in my fridge, freezer, and pantry. For example: If I have chicken breasts in my freezer, I’ll choose a meal from my list that uses chicken breasts for one night. If I have a ton of oats, I’ll choose breakfast options from my list that use oats (usually just oatmeal and fruit, or overnight oats). At this point, I know what ingredients are needed to create the meals on my list. In the beginning, or if you have a long list, you may need to look back (that’s where the source information comes in handy) to create a grocery list. The more you use this list to create your meal plans, the easier the act of meal planning will be. Creating a Master or capsule meal list does require an upfront time investment, but this time is well worth the benefits. Once you’ve created your initial list, you’ll just need to add new meals that you love to the list (remember, it’s an on-going list). Over time, you’ll have a substantial list to pull from and rotate within your weekly meal plans. 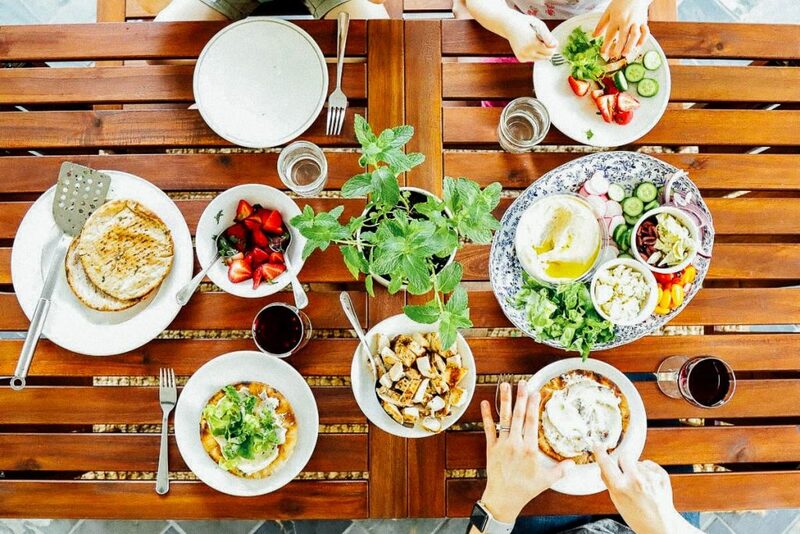 Meal plans that will only take you a few minutes to create because you’re showing up to your meal planning time with tried-and-true ideas and recipes. Love it!! 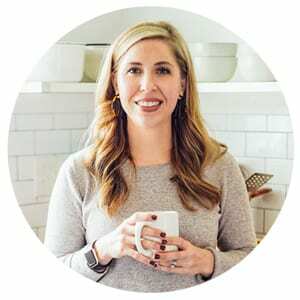 Enjoyed listening…I love how you’re debunking the myths… I am a plan-by-the-month mom because with 5 kids in 4 different activities and my husband and I with full time jobs it is essential or we would be eating delivery pizza nightly. I have tried to convince my friends that meal Planning is the way to go but so far none have really taken to it. I did refer them to your podcast. I love all of your podcasts! Thank you. Thank you so much, Brooke, for sharing the podcast. Love that you’ve found a system that works for you! I was wondering if there was an easy way to print the transcript of the podcast without the pictures? I listen while I’m working which is great but then I need to sit down and highlight and make notes so I can actually put things into practice. That’s just the way my brain works! There may be a way sitting right in front of me that I just don’t see. I’m not very technologically inclined, definitely more of a paper person…. clearly. lol Thank you for your podcast! Hey Paula, I’m so glad you’re enjoying the podcast! The best way, at least that I can think of, is to copy and paste the text into a doc and then print.